How to back up messages to Mac for record keeping? If you want to export your messages and create an additional backup on your Mac computer for record keeping, you can use iFonebox to back up all your messages for record keeping. If you are in a relationship with someone far from you, you must message a lot with him or her. And the messages kept on your iPhone consequently will take much space. Still you don’t want to share these precious messages between you and your beloved. You may argue that you can sync your messages to iTunes/iCloud, but if the backup is corrupted for no good reason, there is no way to retrieve it at all. So What about exporting all your messages to computer and delete them from your iPhone? If you have synced your iPhone to iTunes/iCloud, you can choose to extract the messages from the iTunes/iCloud backup files. If you don’t, you can export the messages directly from the iPhone. However, with iTunes backup file only, you cannot export the messages successfully, as we all know, iTunes does not allow restore certain files or data from the backup file, meaning, you cannot transfer part the backup file. 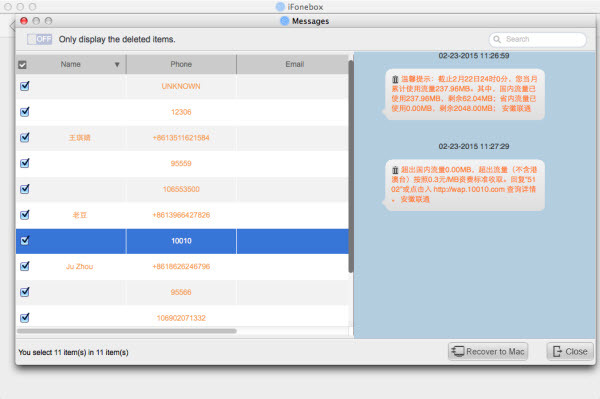 You need some third party software like iFonebox. As specialized iOS data recovery software, iFonebox is capable of recovering not only notes from iPhone, iPad and iPod Touch, but also Contacts, Call History, Photos, Voice Memos, Messages, and Safari Bookmarks etc from iPhone, iPad and iPod Touch as well as from iTunes/iCloud backup file. Now I am going to show you how to export the messages from iTunes backup file with iFonebox which is available for both Mac computer and Windows PC. Please choose the correct version according to what you are using. Before getting down to the detailed tutorial, you can download a free trial version to have a try and you need to pay for full version to backup your messages to your computer. Now let’s dive into detailed steps. Step 1: Install and run the registered version for iFonebox, and click to choose “Recover from iTunes Backup”. And you will be presented with an interface requiring of backup file selection. Please choose the backup file which contains most of the iPhone messages. Step 2: Choose the messages by clicking the messages icon. As it is presented on the interface, you can also choose messages attachment to recover if you want. 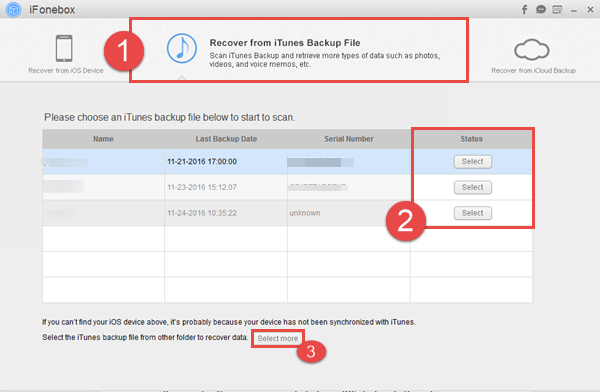 Step 3: Preview the messages extracted from the iTunes backup file, and choose whatever you want to recover. Besides, you can do some modifications about the messages before recovering to computer. After the recovering process finishes, you can delete all the messages on your iPhone or the messages you don’t want anyone else seen from your iPhone permanently.